The Stoneham Chamber of Commerce in partnership with Stop & Shop, MelroseWakefield Health and Winchester Hospital present the 9th Annual Health & Wellness Expo, Saturday, April 6 at Stoneham Town Hall. If your business is focused on health, wellness, fitness, lifestyle changes, stress management, physical therapy, financial/retirement health, and more...this is the opportunity for you to showcase your products and services! To register as an exhibitor, click here. 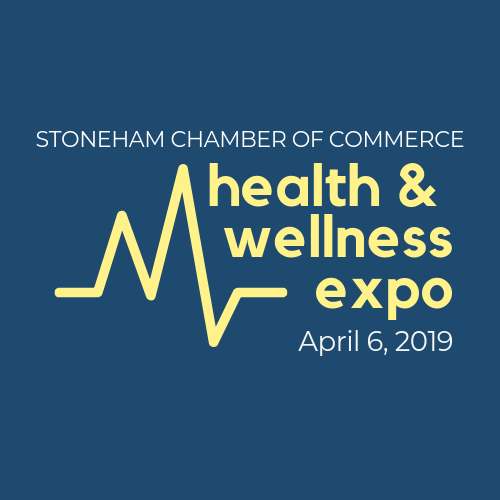 Join the Stoneham Chamber of Commerce, in partnership with Stop & Shop, Winchester Hospital and MelroseWakefield Healthcare for the 9th Annual Health & Wellness Expo. This event is free and open to the public. We encourage all members of the community to attend. Visit a variety of health and wellness booths for information on how you can eat a little better, move a little more, stress a little less and save a little more. Learn about how to address your current health concerns, enhance your physical fitness and address your financial wellness and nutrition. See what wonderful resources our community has to offer for your overall well-being. Prior to the Expo, there will be a 5K Run/Walk and a Fun Run for kids and demonstrations, raffles and giveaways throughout the day. To register as an exhibitor at the event please visit http://stonehamchamber.org/health-wellness-expo/ for more information. If you have any questions, please contact Megan Day at megan@stonehamchamber.org. Stoneham Town Hall, 35 Central Street, Stoneham.